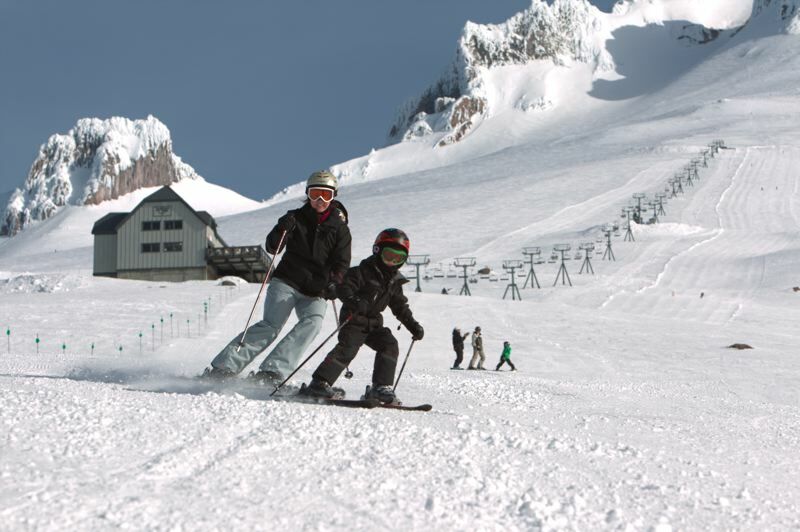 With December looming, Mount Hood resorts and visitors are starting to dream of a white Christmas — but Thanksgiving would be even better. Historically at Mt. Hood Meadows, about 10 miles east of Government Camp, the average day on which snow begins to accumulate is Nov. 26. This year, the resort plans to hold its kickoff event on Saturday, Dec. 1, but forecasts of several inches of snow beginning Thanksgiving day and through the weekend may accommodate "preview" days for skiing and snowboarding (visit https://www.skihood.com/the-mountain/conditions for updates). The resort welcomes visitors to celebrate the season with a five-course Brewer's Dinner, including savory dishes like duck sliders and sweet treats such as fried cheesecake, paired with beers from Backwoods Brewing. Seattle-based rock 'n' roll cover band Junior on the Prowl will provide live music. Reservations for dinner can be made online at www.skihood.com/schedule-events/december1/season-kick-off-brewers-dinner. "Even the worst snow season this year was an average snow season nationally," said Dave Tragethon, Meadows' executive director of communications on Nov. 16. "We're getting used to having a November snowpack, which allows us to have an earlier opening day. We're anxious to get the season started but by no means are we concerned." So far this month, the resort has received about 8 inches of snowfall, and as of Wednesday, Nov. 21, the resort had 4 inches of snow at mid-mountain and 3 inches at the base facilities. "It was enough to start harvesting snow," Tragethon said. "We've done a preview event with as little as 8 inches of natural snowpack in the base area." Tragethon, now in his 25th year at Meadows, is pleased to share additions at the resort, including enhancements of the beginners' areas and new upper-mountain experiences for beginners. "It's really an extension of the experience we're making for beginners," Tragethon said. "To see all of those (features) come together, that's very exciting." Aside from snow features, the Meadows rental shop has received a fleet of new snowboards, and the resort will launch a dynamic ticket pricing system similar to the way airlines price tickets based on the day, demand and demographics. "Our goal is to change some visitation behavior from our guests by offering a discounted lift ticket on peak days," Tragethon added. "That will help us better manage our overall experience." High above the village of Government Camp, Timberline Lodge has seen about 18 inches of snowfall this year so far. As of Wednesday, the resort with the iconic 1920s lodge had around 5 inches of snow on the ground, which started from flurries beginning about a month ago. "We're not in the weather forecasting business," said John Burton, director of Timberline's marketing and public relations. "We open when Mother Nature says we can open." There are a plethora of features new to the resort this season, especially considering the resort's purchase of Summit Ski Area just east of Government Camp's village business district. R.L.K. and Company, operator of Timberline Lodge and Ski Area, purchased Summit, including Snow Bunny, in July. Timberline is operating both areas under a special use permit from the Mt. Hood National Forest. "We are very pleased with the acquisition and plan to operate Summit Ski Area as a family-oriented, affordable, friendly mountain resort," said Jeff Kohnstamm, Timberline president and area operator in a statement last summer. He identifies Summit as a place to "break down the barriers to skiing and snowboarding surrounding accessibility and affordability." "We're kind of putting a breath of fresh air into Summit this year," Burton noted. With the purchase of Summit, Timberline operators also have new ski and snowboard rentals available. The lodge has received upgrades and there are 17 new features in the terrain parks. Lower on the mountain, staff Mt. Hood Skibowl on Highway 26 at Government Camp plans to open its tubing hill on Friday, Nov. 23. "We have an all-weather, snow-making machine," said Mike Quinn, Skibowl vice president and general manager. "I'm looking forward to getting the season underway. Historically, Skibowl opens around the second week of December. National Weather Service forecasts calls for a mix of rain and snow beginning Thanksgiving night, with snow continuing through Saturday and rain on Sunday. Highs are forecast in the upper 30s with lows from 33 to 37 degrees. Quinn doesn't want to give a prediction of when the resort will see subtstantial snowfall, but remains optimistic. "Although the forecasts are predicting an El Nino year, 50 percent of those years turn out to be average," Quinn assured. "It's too early to be doom and gloom. We plan to open up when Mother Nature lets us."